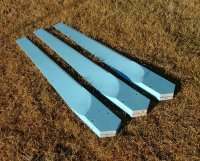 TheBackShed.com - Chainsaw cut windmill blades. are the way to go. 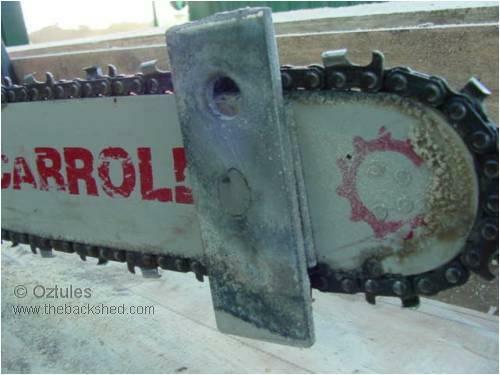 Making a set of blades with a Chainsaw. Oztules, a forum member from Flinders Island, has come up with a faster way of making the rough shape for a set of timber blades. 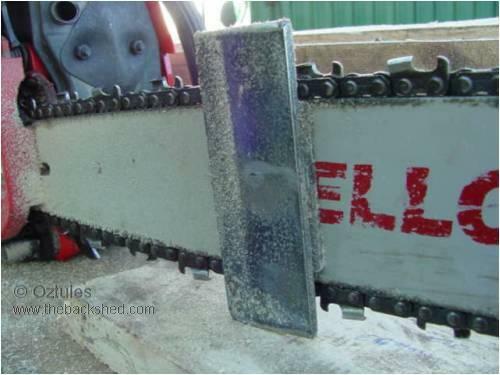 Getting the rough cut is one of the most time consuming parts of timber blade manufacture, and if your like me and couldnt cut a straight line if your life depended on it, then Oztules method might be the answer! 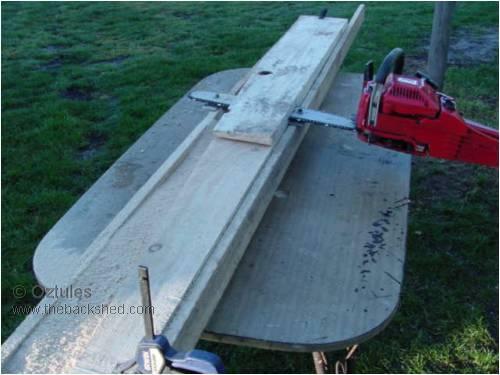 If you're not familiar with the process of making timber blades, then I recommend you check out Hugh Piggotts site or OtherPower, both excellent web sites for home made windmills. 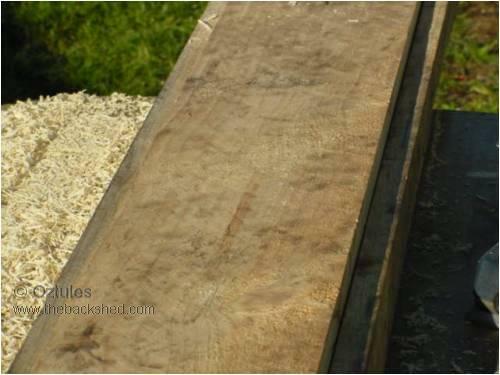 It has been about 9 months since we cut up a pine tree from the other side of the Island. 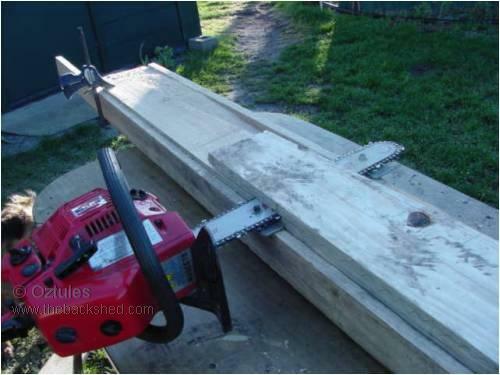 Out of this I got some 8"x2" planks cut up by the bloke with the portable saw mill. They have sat on the floor of the shed for all this time and were now much much lighter than they were when they were green. I had been lucky that they were green, as it gave me a good excuse to do nothing....but alas, it was time to consider doing something. 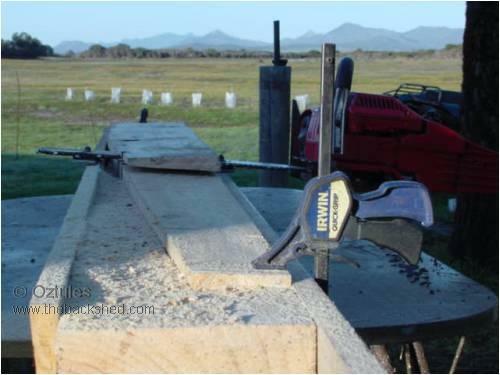 I am the first to admit that I'm a lazy slob, and the thought of getting a hand saw and doing all the cuts and then chiseling them out..... well after doing a small 8' set some years ago, I just couldn't get excited about it. If only there were a way to do it easy. 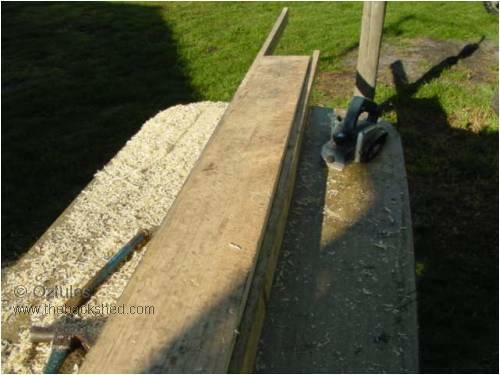 I have no band saw, so there was no quick way of getting rid of a lot of timber before the carving began (as they show on Otherpower), so I contemplated life with 30kgs of shavings from what was to be my 4M blade set. 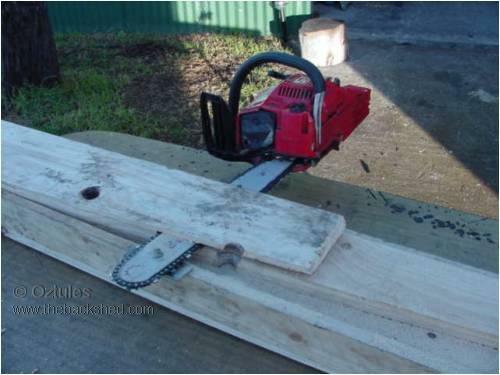 I had been sawing up some firewood out in my forest one day, when the thought of slitting the timber with the chain saw came into focus... Ahh yes thats it!!. Flushed with my new enthusiasm, I decided to see how accurately I could saw in a straight line on a log..... it turns out that not very accurately at all summed it up quite nicely. I was thoroughly beaten again. It was while I was re-reading the way Danb did his rough and simple 10' set, that it hit me that doing it his way meant that it was all straight lines.... so it was decided. A JIG!! Here is the 20 minute jig I came up with. 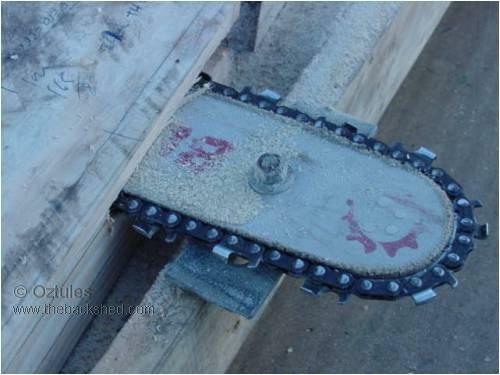 It uses the Dans 3 degree at the tip, 6 degree at the center and extrapolate to the sensible end of your timber size, and blade thickness= 1/8 blade width, and best line of fit from the tip to somewhere near the root. 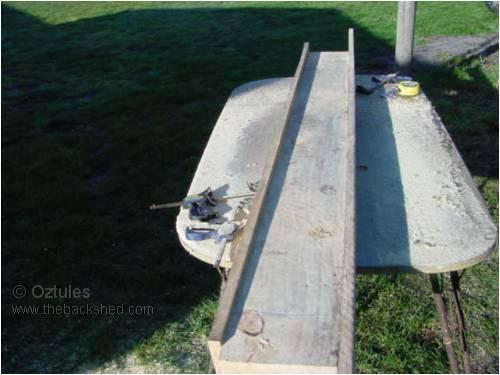 It consists of two pieces of 3x1 down either side of my 4th piece of 8x2 timber I had. It is 2M long. Here is a timber blank sitting in the jig ready for "processing" It needs to be held down while slitting obviously, and I used the clamps for this. Here is a full view of it..... yes lots of pictures just in case anyone else is silly enough to try it. 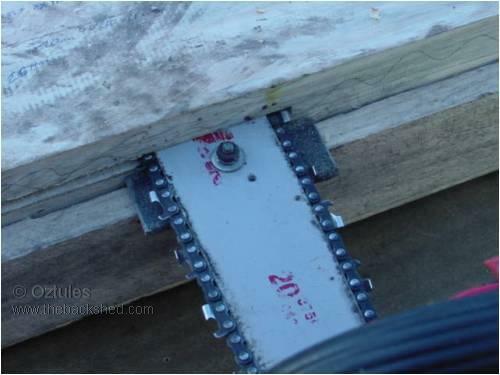 Well now I guess I must show how we get the chain saw to follow the jig we have set up.